Shouldn't it be Happy Square Day? 3^2 = 9, but sqrt(9) = +/- 3, not just 3. Today is a great day to celebrate...and it is Hip to be Square. Today is great squared for me (hehehehehehe) it is my 36th birthday!!!!! I am super geeked!!!!! I've always said my birthday was easy to remember! It's (3^2)^2! That's 3/9/81. It is a true square birthday! and yes, it IS hip to be square! happy birthday courtney! Personally, as semi-cool is this day is, I really think it's a bad name. Sure, 3×3 = 9, but the date 03032009 CANNOT be taken a square root of and be a whole number. It's an even bigger travesty, because 2009 is the only year this decade that has dates that you can take a square root of. AND it happens THURSDAY!!!!! (For those of us following American date conventions). I think there should be a big deal about this. I hope Elizabeth Landau writes something up about it for Thursday. 03052009 is a perfect square. When you take the square root of it, you get exactly 1747. Also, no joke, April Fools this year can be taken a square root of. The square root of 04012009 is exactly 2003. No more dates (after these two coming up shortly) until 2016! Only nine 'square root days' in a century? If one considers the 100th year of any century – the one ending in '00' (and yes, the '00' years are the END of a century, not the beginning) - then 10/10/2100 would be the tenth such 'square root day' in this century. 355/113 = Pi to better than 1 part in a million. For me, it is not only square root day today, but "Cubed Day" as well – I turn 27 today (3 x 3 x 3 = 27)! Weird! Pi day 6 years from now will be the one time a century where we get 5 digits of pi (3/14/15). Let's see: 1/1/01, 2/2/04, 3/3/09, 4/4/16, 5/5/25, 6/6/36, 7/7/49, 8/8/64, 9/9/81/ 10/10/100. However, this would only be true in the 1st century CE. To carry on: 11/11/121, 12/12/144 and that's all there will ever be, a total of 12 actual square dates. Thankfully we missed these dire dates by around 19 centuries. Whew! Dropping the first two digits from the year yields only minor reasons to panic. I'm a graduate student in mathematics, and I'm getting married on Pi Day. Woohoo! Tom C's correction is only part of the story. There will also be additional 'square days' next century. 11 x 11 = 121 which should real excitementing in 2121. *OMFG* – 2121 is *another* square. Our cups runneth over ! 12 x 12 = 144 which of course like 10×10 and 11×11, will only happen once per millenium. Now that's reason to celebrate BIG TIME!!! Kinda' wants you to take better care of yourself so you can live to see those amazing days, doesn't it? 3 from base 10; - to base 12 - then .14 base 10 to base 28-31 ? 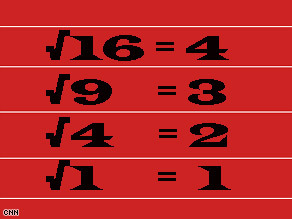 To the second poster: the square root of 9 is just 3, not +/- 3. It is true that (-3)^2 = 9, though. The reason for this is that "square root" is a function: and in mathematics, functions take one input and can give only ONE output. square root of what exactly? what are we talking about here? I'm a computer science major and I still think this guy is a nerd. What is the advantage of the fraction form ? a mathematical function, but y=x^2 is. The time between each "square root day" inreases by exactly two more years. 1/1/2001, 3 yrs later 2/2/2004, 5 yrs later 3/3/2009, 7 yrs later 4/4/2016, 9 yrs later 5/5/2025, 11 yrs later 6/6/2036, 13 yrs later 7/7/2049, 15 yrs later 8/8/2064, ...11/11/2121, 23 yrs later 12/12/2144, and then 25 yrs later 13/13/2169 (aka 1/13/2169) is opposite day. But everyone know that. Oh don't deny it, you know it. Easy to remember and original to me. Nine decimals isn't too bad. "quadrillionth (1,000,000,000,000,000:th) bit of π, which" = "0"